Basset Hounds have become known as the 'Hush Puppy' dog, following a long and successful advertising campaign by a shoe manufacturer. Basset Hounds are short legged and heavy of bone, movement looks humorous, but never clumsy. The Basset Hound (not Basset Hound) is mild tempered, but can be stubborn. He can also be vocal at times, with his almost 'singing' bark – which can become unpopular with the neighbours! A lovely and amusing household pet, for families with a good sense of humour. Absolutely obedient and loyal to his master, Basset Hounds make a wonderful family companion. 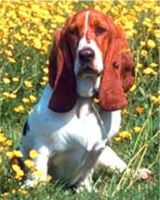 Basset Hounds are a multi-purpose hunting dog, with an ultra keen nose and gentle nature, making them well suited to hunting in packs or by himself. Principally used for hunting rabbits, they are a smooth moving hunting dog, easy to follow on foot – with distinctive 'voice' so you know where he is. Their coat is thick and tight to protect him well from dense cover and brambles. 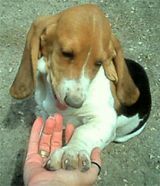 Our 4 Paw Rating - to the suitability of Basset Hounds for your home and lifestyle. Adores the outdoor life and loves to be involved. However, remember he is a hunting dog at heart and inclined to wander – make sure your backyard is securely fenced! Suited to urban or rural life, as long as regular exercise. Has a stubborn streak, so will need consistency and plenty of repetition – reward rather than punish, as he is a loving and gentle creature.